I don't think I've ever shared my love of Star Wars with you guys...hmmm I guess there's no time like the present. With the new movie coming out I decided to turn our first snow day into a Star Wars Movie Day!! I wanted to think of something fun, interesting and yummy, so I went all out and created a Star Wars themed pancake bar with all the trimmings, I even found some themed pancakes at the grocery store. I wrapped the table top in a fun holiday themed paper that I found at the toy store. I just used regular wrapping paper and covered the top then tucked the edges up under the edges. It looked so much better than any ole' table cloth, and it gave a bright and colorful look to the whole look. From there I took several small condiment bowls, and filled them with lots of different toppings and garnishes like fresh fruit, nutella, chocolate chips, and marshmallows. I like to use the fresh fruit more than anything because its so yummy, colorful and healthy. As you can see the colorful appeal of the toppings looks fantastic atop of the theme paper. Since it was a pancake bar I decided to go with the breakfast theme and make some strawberry orange juices, I also added in a bowl of donuts, crunchy peanut butter, pancake syrup, and sprinkles. Then because it was a movie day, I added in couple of (overflowing with popcorn) movie theater popcorn boxes, the ones with the red and white stripes. When I see those the first thing I think of is the movie theater. I also scattered popcorn all over the table to tie the movie theme in and give it a cohesive look. To top it off and finish the look, I added some of the cutest Star Wars figurines here and there on the table. I added in a plate of fried eggs and turkey bacon, to go with the pancakes and OJ. All in all I have to say I'm pretty pleased with the final results, let's just say I accomplished the idea of something fun and different...lol!! Look at these pancakes...the cutest ever right? They have six different faces of the characters from the movies, I couldn't of found anything better or more fitting for my little idea. You ever get a crazy idea that you just have to follow through on?..lol!! Let's just say that by the end of the day we where more than pumped and ready to see the new movie. Did you see it yet?? I won't put out any spoilers, I'll just say it's amazing!! If you're a Star Wars family like we are you're gonna LOVE IT!! I hope you guys enjoyed my little craziness as much as Rob did, it was fun and like I said something different. I'm just realizing Christmas is almost here...Wow this year went by so so fast! I'm so excited about spending time with my family, and the possibilities of a whole new year of new experiences. I'm also super eager to go to New York Fashion Week in February, especially since it will be cold weather. I love cold weather because of the fashion, nothing is better than a cuddly and warm North Face fleece, a cute pair of skinny jeans and over the knee boots. Now that's a killer look in my opinion, and it's comfortable. As you can see in the images below I was outside enjoying the tiny bit of snow we did get in the same exact style. I'm excited for more snow because I love sitting by the fire with a cup of hot cocoa, snuggling up with cute little Piper. There's nothing better, and that's a kind of cozy you just can't get when it's 80 degrees outside...am I right? I have to admit though, I will always enjoy my ice cream...cold or not...lol!! Piper even got in on the first snow fun with me, but for her it was a first snow in two ways...or as they say the last first. She has never experienced snow before, I'm so glad she loves it as much as her Mama. She stayed nice and warm in her cute little coat as she frolicked around sniffing and exploring. With her crazy curiosity I can see I'm in for it, you guys have a wonderful week and stay warm!! You are truly a woman of my own heart! I’ve been a Star Wars fan since I was a child and it has only gotten worse. This is such a neat idea! Oh so cute! I actually have never seen any of the SW movies, it's just not my type of movies, lol but I know a lot of people like it. I love the spread! These pancakes are the coolest! We can t wait to watch Star Wars this weekend! Wow!!! My son can die for those Star Wars pancakes. Great job!! So cool! I can’t wait to see the movie but i won’t be able to go for a few weeks still! my friend would love this star wars pancake maker. This sounds perfect for us. My fiancé loves star wars and I love breakfast foods for any meal of the day! Those pancakes look amazing and delicious! I have not seen these pancakes but these are great ideas and make breakfast fun. those look so fun! You did a great job with that set up, my daughter would be so excited. I'm lucky to just get the pancakes on the table lol. This is amazing. My crew would so love it! Love Star Wars and Pancakes, what a perfect combination, these pancakes look fun and delicious. Star Wars and pancakes, 2 things that go good together. Daniel is going to love these !!! He is just getting into Star Wars !!! OK. Yep, I'm sure I will be looking for those Eggo's! My nephews love Eggo's & they love Star Wars. Okay, you'll probably think I am crazy, but believe it or not, I have never watched star wars. These pancakes look like so much fun to make and eat! I have never watched star wars or had the "wish to". I know I'm weird I guess. Just not into sci fi. This would be the coolest either breakfast for dinner or just breakfast for a boys sleepover. Hi, i am from Venezuela, i love it your blog. Star Wars and pancakes. Mmmm yummy. Wow, your house is a lot more fun than mine! I love the Star Wars breakfast. I love the theme and the food looks delicious. This would be my niece's dream birthday breakfast! we love star wars and pancakes!! looks great! I love Star Wars also! I have seen every movie and am headed today to see the new one at the movie theater. I love the pancakes! They are the bomb! Those are adorable pancakes! We haven't yet seen the new movie but hoping to do so within the next few days! I love the Star Wars theme breakfast! Man, I'll bet them pancakes are good. Im sooo happy to know another Star Wars nerd! I'm proud to say I love anything that is Star Wars and that pancake looks delicious! Princess Leia would be proud. The pancakes look so delicious. I know some grown kids that would love them. OH GOD! I want to eat those pancakes everyday, i didnt even knew they exist! I tried these from Wal-mart. They taste so good and are super fun! I tried them on Daniel one morning and they were a huge hit !!! Thanks for sharing !!! This is perfect...and fun! Love it! What a combination! Star Wars and Pancakes! Brava! Apologies for the duplicate comment, but I was on my Kindle earlier and wasn't able to comment on separate posts for some reason. I am a Star Wars fan, not a fanatic. I still remember when I saw the 1st Star Wars movie. Are you aware that the word fan is just a shortened form for fanatic! What fun ideas for Star Wars fans. I finally saw the movie the other night and it was really good! So cute! Love the extra touches you gave this little breakfast! Yes, those pancakes are indeed perfect. I will definitely be getting some for my little ones. this is my kids dream breakfast!!! That looks awesome and delicious! I wish I could do that. I am definitely going to be trying those pancakes. I would love Star Wars breakfast, lunch, and dinner!!! Every year on May the 4th I take light sabers made of pretzel rods dipped in colored chocolate to work, and they are a big hit. Love EVERYTHING Star Wars! I too am a Starwars fan! Love these ideas! Love the topping combination. That would be more than delicious. Love, love, love the pancakes! Some of the coolest pancakes I have seen in a while! WOW!! Those pancakes are almost too cool to eat! Amazing. Star Wars. Food and fun! What fun! My son loves Star Wars stuff. Really love the Star Wars pancakes! My family would be so excited if I surprised them with a Star Wars fun breakfast like this. This would be so much fun to make for my fiancé. He adores star wars. I love your awesome Star Wars pancake and set up. The food looks delicious. I wish you were my neighbor and we were friends, I’ll be at your house whenever you invite me over for some delicious eating. I have a step-cousin that is 18 years older than me and he has been OBSESSED with Star Wars from the beginning. He even had Star Wars bed sheets on his bed even though he was married with children. I'll never forget that. Hilarious! These pancakes look absolutely wonderful! Adorable! My nephew would LOVE to wake up to these. He's a Star Wars fanatic! Please design my house with you smart sense of style. I'm a big Star Wars fan myself but you like made me like it more. OMG OMG OMG!!! I'm 57 and have never seen a second of any Star Wars in my life. I never thought of a breakfast celebration. How clever and fun! I am honestly the biggest fan of star wars to date. I love the whole idea and the ideas and elegance here are amazing! Who doesn't love Star Wars?! Now that's what I call a out-of-this-world breakfast!!!!! You're a very funny and interesting person, Dana. I love reading your blogs. Makes me feel good the whole day. 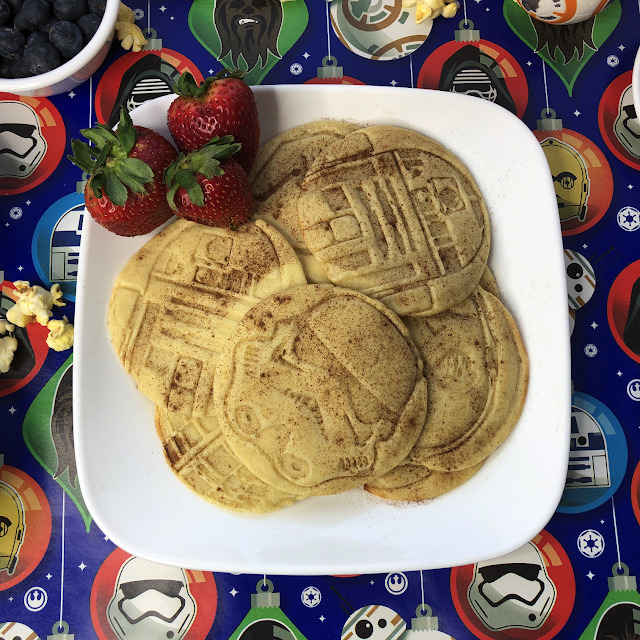 I love Star Wars and pancakes too didnt know they had pancakes in the shape of them though my kids would love them thanks for sharing I will have to find them next time I go shopping. This is awesome for any Starwars fan!! I know my family would love a pancake breakfast like this. I would definitely say that is an addiction lol. I have seen a lot of these star wars items on think geek and we also have a few ourselves. The next item we are getting is probably a star wars french press. We have a giant r2d2 floor lamp that we have fought over in a hypothetical divorce. The only solution is to get a 2nd one, since we love it so much. Looks cool, I hope it taste as good as it looks aha. I don't even like Star Wars (sorry, not sorry) but, I know I will love those pancakes! Haha. You did a excellent job setting up the table. It looks inviting and delicious. My nephews are amazed that I remember a world without Star Wars, ha. Yep, I was 12 when I sat in a theater & waited to see the very first Star Wars. I really like this. What a great idea and great fruit to go along with it. the food looks great. However, Piper is absolutely the Cutest!!! Oh, my grandsons would be so surprised if I pulled this out for breakfast. They are so looking forward to seeing the new Star Wars movie. Perfect timing.. I'm on the search! I love the Star Wars pancakes. But especially, the hot chocolate with the little Gingerbread cookie on top of it! The pancakes look excellent. i like the boots too and especially that star wars is my family's favorite show. Piper is the cutest of all. I love these! My son loves Star Wars and adding strawberries and chocolate to top off his pancakes. The pancakes look excellent.Some of the coolest pancakes I have seen in a while! These pancakes would be a real hit with my grandchildren. They are pretty cool looking. The coffee, or hot chocolate if it is, looks really good, especially with the little gingerbread man cookie, or whatever that is, in the drink! I'm a huge Star Wars fan, I didn't even know they had pancakes like this. I would buy them and not eat them. I didn't think my grandsons were that big on Star Wars except the light sabers but they sure have become Star Wars fans within the last year. So glad you told me about the pancakes. I haven't seen them in the stores. They would love. They would also love the whole setup. We have movie night at least once a month usually twice. This is a great idea. Thank you. I am older and remember the wonder at the original Star Wars. I think we saw hat movie maybe a dozen times or more. We were obsessed. I recently saw the original again, and thought how the special effects have sure changed! Back then we thought the effects were real. Love these pancakes, and I am glad to see an interest in this movie again, I dont think anyone who made it exp-ected it to go this far. I am still sad about Carrie Fisher..
My daughter would flip out if we had these for breakfast! She's 10 and Rey is her favorite. I seriously would of never thought of this. We are big fans of both and can't wait to share this with my family and friends. This looks amazing! What a fun and delicious idea. And a perfect way to celebrate the movie. We saw it and loved it too. I am a Star Wars fanatic too and my niece calls me a Star Wars geek. I love the pancakes and they look delicious. This looks like such a wonderful idea. How fun are these?! Love it! such cute pancakes, my nephew loves star wars! My grandson would love the decorations and the food looks yummy. Sounds like a perfect snow day! I'm also a huge Star Wars fan. Love these Star Wars pancakes. My son's favorite breakfast is pancakes and we both are serious fans of Star Wars. Gave me some great ideas for breakfast with the grandchildren. Thanks. Omg, yummy, and super cuteee poppy!! I love the way you set it all up. The pancakes are awesome and it looks like it was a whole Star Wars experience. I am definitely looking for these pancakes when I go shopping. My nieces and nephews will love these. That's awesome! I love Star Wars! The Droids are my favorite! Waaw,.. What an co-incidence,.. iw as craving for pancakes today and was thinking what flavor pancake to prepare and Now I got the idea,.. Thank you,.. Awesome pictures,.. I just can't get my head around this obsession with Star Wars. My niece who is 35 & with child attacks like a 6 year old over Star Wars. Theme parties are so much fun. I have a friend that she does them all the time, she loves the challenge of finding things. Of course she shops flea markets/thrifty stores / yard sales and stores stuff till she needs it. My husband would love the pancakes. This is amazing! I'm a die hard Star Wars fan. I wish I was invited to your Star Wars Movie Day party! I love the star wars pancakes! I need to get that pancake maker! Those are really awesome pancakes! This was fabulous. My grandsons would beg on bended knee to have me duplicate it. How awesome. I love those pancakes too. Never seen them here. You did a great and creative breakfast in SW's theme. This would be a great birthday breakfast or dinner for a Star Wars fan. Great idea. Oh my goodness! I need to get those pancakes! My son would flip! This is such a fun post! I need Star Wars pancakes in my life. Those pancakes are too cute, I love it!! My son has just finished putting himself through college and earned his bachelor's degree in computer science. He is a huge Star Wars fan. I'd love to make him a Star Wars themed breakfast to celebrate his achievements! Cool breakfast for the Star Wars fanatic! My son is nutty about Star Wars too. He'd love those pancakes. I too am a Star Wars fan. May the force be with you! This would be such a fun weekend breakfast! This is such a fun and cute presentation! I will have to try that sometime! I never have done a movie theme tabletop presentation. My fiance loves movies so I will have to find a good movie theme and try to do that. The food looked delicious too! I could get into eating a breakfast with these yummy items. My son-in-law would love these pancakes. He's a Star Wars maniac. Thanks for sharing! Who doesn't love Star Wars. These are awesome! What a fun idea. This is a great idea to put a smile on a child or adults face. It all looks so good. After reading this and seeing the pictures,now I want some pancakes:). Also I'm a big Star Wars fan myself. I've seen the movies countless times. Star Wars! Such cute and unique ideas! My nephew would love, Love, LOVE these Star Wars pancakes!! I'm not a Star Wars fan, but niece is really into it and would love this article.